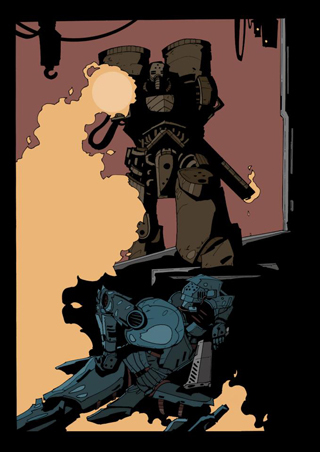 Dan Morison brings his talented art to the world of En-Mercs with this great scene as Michael Wyman faces off against the Bhel (aka Flamebot) Mech. His colouring and style really bring this scene to life and convey the characters fantastically. More to come soon on this, so watch this space for even more amazing work to come! Also, don’t forget to join the Official En-Mercs Facebook page here, for all of the up to date news on the project. This entry was posted in Comics, Images, Updates. Bookmark the permalink. How do you overcome any defence? The official website for the En-Mercs graphic novel. Updated regularly.